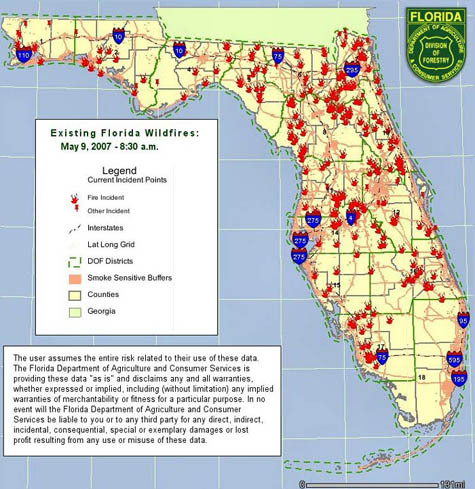 Here is a map of all the wildfires currently burning in Florida. I found this on What Really Happened.com Notice how all the areas where wildfires are burning are where the Republicans live, and all the areas that are not burning. (Southeast part of the state, like Miami) are where the Democrats mostly live. More bad Karma for foisting the Bush nightmare on us all. Actually California has already had a few fires and it’s only May. The fire season doesn’t usually start until late August. That’s because we had no rain this winter. The driest Winter ever in L.A. which means that we will be having lots of fires all summer long. One more sign of the global warming catastrophe coming our way. This entry was posted	on Tuesday, May 15th, 2007 at 6:02 am	and is filed under Main Blog (All Posts), Pictures. You can follow any responses to this entry through the RSS 2.0 feed. Both comments and pings are currently closed.